Our spacious and versatile, balcony surrounded Syke Suite is the perfect space to train, inspire and entertain staff and clients. Whether it’s an intimate board meeting or a large conference you can be assured of our commitment to the success of your event with our dedicated staff members on hand to deliver impeccable service. 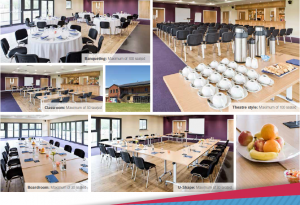 We have a range of on-site amenities and welcome the opportunity to tailor delegate packages to your individual requirements.